Dylan Smith is creating fabulous flavours at The Cellar. Frank Chemaly is impressed. A good friend and I decided we needed to get away from it all. And so we went on a little road trip and spent a few days down the South Coast… exploring, relaxing and, yes obviously, eating. We were far away from truculent teens, demanding parents, creaking plumbing and rotting balustrades that seem to fill everyday life. I had wanted to go back to The Cellar. I was impressed the last time I ate there and another friend fed me with recent good reports. Chef Dylan Smith is certainly a talented man and his restaurant is one of the few fine dining experiences on the South Coast. The restaurant is literally the cellar of the main house but it’s been decorated with warm colours, eclectic art and Persian carpets to give it a warm cosy feel. It looks out over the pool and in summer the whole front is open to the elements. We perused a very reasonably priced wine list and decided that as it was holiday time, we needed bubbles. Well, after the cork exploded somewhat prematurely catching us all by surprise (not a drop was wasted, though), we said cheers and got down to the serious business of the evening. It’s a menu that changes regularly with fresh seasonal produce featured on a short list that takes in five or six starters and the same with mains. Starters were possibly the most interesting – all priced at R75. I eyed the slow cooked lamb ravioli with vodka infused cream, roast pears, Parmesan and dukkah. Also tempting was the grilled salmon with soy gel, cucumber salad, rice vinegar and ginger emulsion, steamed mussels with coriander and sea salt foam. Basically a warm sushi salad we decided. Prawns came in a bisque with grilled onions, cherry tomatoes and a roast pepper arancini ball with pesto. But we’d had prawns for lunch. The lady opted for the grilled mushrooms with balsamic hollandaise, toasted brioche, rocket glazed cherries and port reduction. The mushrooms were excellent as was the sauce, although we both felt the cherries made the dish too sweet. It needed the rocket to cut through it all. I liked the idea of tomato soup with basil ice-cream, toasted onions, parmesan biscuit and black pepper gremolata. Once all those flavors merged into the soup it was a very moorish dish. Mains are works of art. There’s a lamb cutlet with slow-cooked lamb neck on a pea and wasabi puree, red wine jus, frilled courgette and cannellini bean cassoulet with crisp onion rings (R170). Possibly one too many things on the plate, I thought. 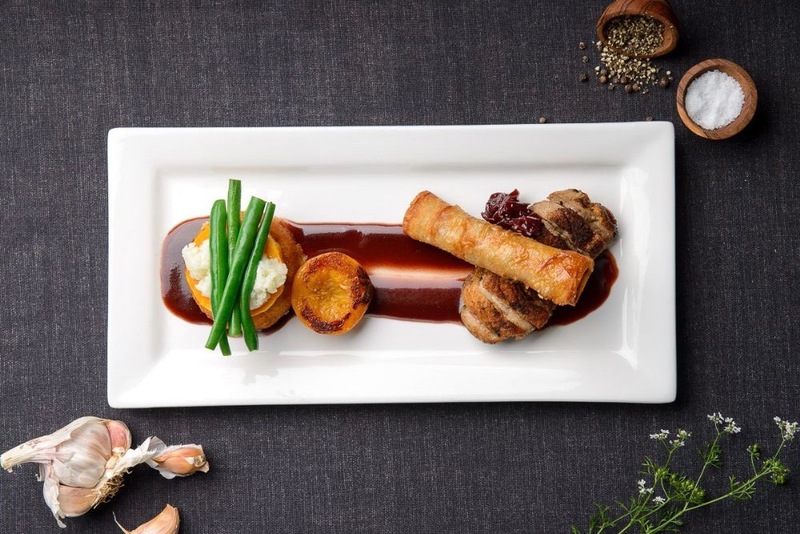 I felt like the grilled pork loin (not a lion as was recently printed on the menu of one of Durban’s very exclusive hotels) with crispy pork belly, red cabbage salad, ginger and apple sauce, potato wontons, roast onion jus and carrot crisps (R165). The loin was perfectly cooked, but the pork belly was exceptional, both meltingly tender and crisp at the same time – I never did get to enquire as to how it was cooked. The ginger in the sauce was also a good touch and the potato wontons light and crisp. There was probably too much food on the plate, but no doubt the locals have healthy appetites. 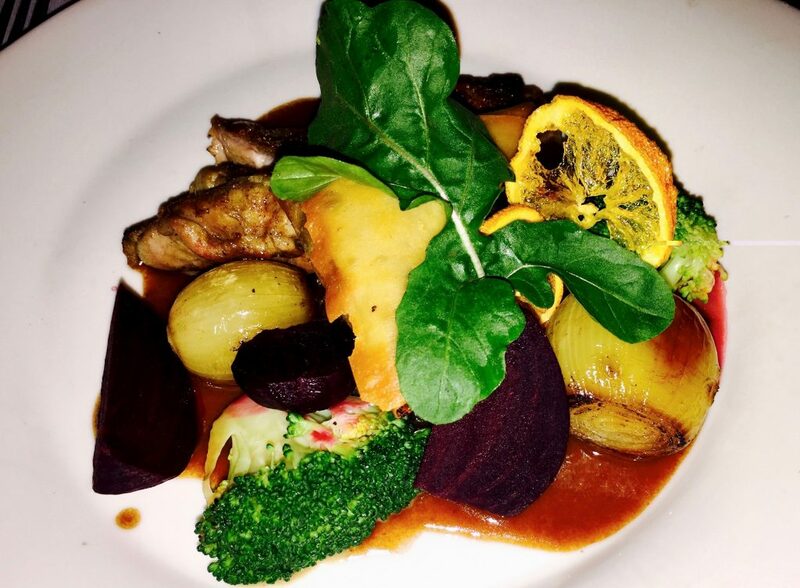 The lady settled on the orange and chocolate duck breast (R175) which was cooked medium as ordered. I liked the sauce. Fortunately, you couldn’t actually taste chocolate, but it did richen things up a lot. It was served with a duck samoosa, which she wasn’t wild about, but it’s phyllo casing was beautifully crisp. Roasted beetroot added color and an earthiness to the plate. Then it was time for dessert. The question was could we find our second stomach? Our charming young waiter sang the praises of the pecan tart with butterscotch ice-cream. But it didn’t quite appeal. The lady fell for the white chocolate creme brûlée with passion fruit dressing (R60). We’re both lovers of passion fruit so gave this the thumbs up. The brûlée crust so thin it was almost a wafer – exactly how it should be. I eyed the chocolate mousse with salted pecan praline, candied beetroot, berry shortbread and cream cheese served as a “eat ‘n mess” with a citrus and white chocolate sauce (R60). Well the thought of white chocolate sauce at this stage gave me visions of being rushed into ICU, so I asked the chef if it could be served with just the first two ingredients. After all no great meal is complete without a wafer thin slice of after dinner chocolate mousse. The mousse was silky rich and had a good depth of flavour and, even better, was not too sweet. The salted pecan praline was more a fudge and was unusual, but not unpleasant. Let’s say interesting. We finished up an enjoyable evening with coffees around the pool. – This first appeared in the Independent on Saturday, July 2017. – Top two pictures from The Cellar, third picture by Frank Chemaly.